The Great Blue Heron is one of the largest wading birds in the �heron �family. The Great Blue Heron can stand 3-4 � feet tall with a wingspan of 5-6 � feet. The Great Blue Heron along with other members of its family are recognized in flight by the �S� shape of its neck (note photo above on right taken in Seney National Wildlife Refuge in the Upper Peninsula of Michigan). 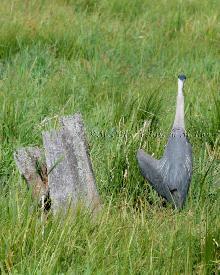 The Great Blue Heron�s body feathers are bluish gray. Its has a white stripe on its crown with a black plume from behind its eye to the back of its neck. The Great Blue Heron also has a beautiful plume on the front of its neck which fluffs out when in breeding season. The edge of its wings and thighs are a flesh color which makes it appear to be molting. The Great Blue Heron�s eyes and bill are yellow and its legs are brownish green. Both male and female are similar. The young are also the same except for the lack of a neck plume. When wintering in Florida the Great Blue Heron seems to be more photo friendly. But when in its solitary mode it is much more difficult to capture. Teresa was fortunate enough to sneak up on this beautiful Great Blue Heron at Seney National Wildlife Refuge in the Upper Peninsula of Michigan. She was able to photograph it for over twenty minutes as it slowly ate its way along the edge of F Pool. Although generally a loner the Great Blue Heron mostly nests in large colonies known as rookeries. Its platform like nest is made of sticks and green material such as moss. The pair share incubation time They also share in the feeding which as the young get bigger is a constant job. They incubate 2-6 eggs but like most creatures it is survival of the biggest and fittest. It is fun and interesting to watch the young when they catch sight of the parent coming back with food. 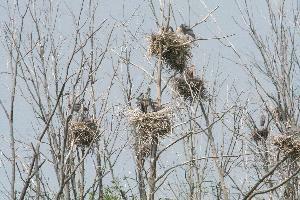 The photos of the rookery above were taken by Teresa off old U.S. 27 near Houghton Lake. Some people have commented that they thought those were Bald Eagle nests. Alas, no. Eagles do not nest in colonies. They need a large territory to feed themselves and their young. 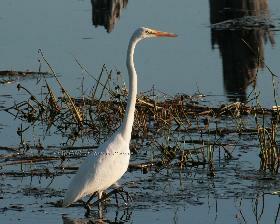 The Great Egret is found across much of North America and other parts of the world. It is slightly smaller than its relative the Great Blue Heron. What sets this exotic bird apart from its relative is the contrasting of its yellow bill and black legs against its all of the Great Egret�s bright white plumage. During breeding season the Egret�s bill becomes darker and its legs lighter in color. Breeding season is also when the Great Egret shows off its long plumage on its back. It is in fact this beautiful plumage which caused the Great Egret to become endangered by the end of the19th century. 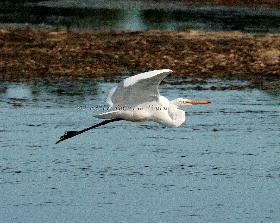 Women all clambered to wear the Great Egret�s delicate plumage in their elaborate hats of the era.. 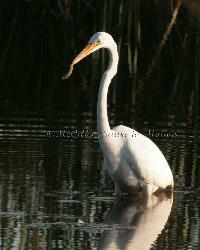 The National Audubon Society chose the Great Egret to be its symbol for that exact reason. The Society was formed to prevent killing of birds for such trivial use of their feathers. The Great Egret nest in similar rookeries as the Great Blue Heron. They incubate generally three eggs. Again it is survival of the biggest and fittest of the young. From Southern Canada to the Northern United States from Maine to Washington to the Mississippi River the Great Egret calls all of these places home at any given stage in its life. The photos above and below were captured by Teresa at two different times and places. She was fortunate enough to be at Seney National Wildlife Refuge in the Upper Peninsula of Michigan when two Great Egrets came to visit for the day on the North Show Pool(photos on the right). The second visit was on the Jordan River in East Jordan, Michigan. This Great Egret spent a number of days in the area before moving on(photos on the left). This member of the Heron family was unknown to the McGills until one day while driving by a pond at the edge of town, Michael noticed a strange looking little bird. 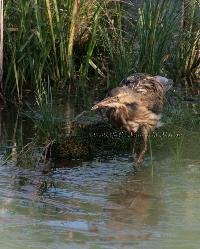 After further investigation they found out it was a Green Heron. The McGills spent most of that summer off and on at Craven Pond in Bellaire, Michigan filming and photographing this unique bird and its offspring. At fifteen to twenty-two inches high, it is one of the smallest of the Herons. 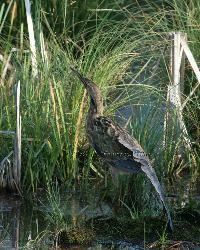 The Green Heron prefers small wetlands in low-lying areas. They do not like to feed in areas with other waders. 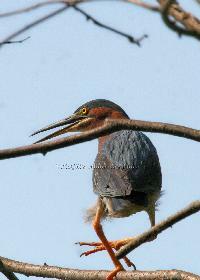 The Green Heron will stand on the edge of the shore or in shallow water or even perch on branches to hunt. They are known to even drop an insect on the water to attract fish making them one of the few known species to use this "baiting" system. The Green Heron is monogamus within a breeding season. They nest in forest or swamps over or near water. Their nests are platforms of sticks often in trees or shrubs. Depending on the success of the nesting area, the Green Heron may not return if they find a better habitat the following season. 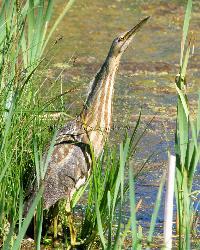 The least visible and therefore the least known of the Heron family, The American Bittern, whether approached by an intruder or in pursuit of it's prey, stretches it's head skyward to make itself "invisible" in the reeds of the marshes and wetlands it chooses to live in. 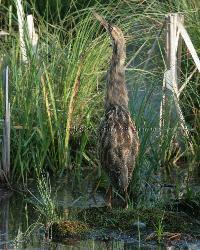 The female American Bittern builds the isolated nest while the male guards it. The female incubates 2-3 eggs for 30 days. After six weeks the young will leave the nest. Teresa was able to not only see this special bird but also capture this unique positioning on more than one occasion while trekking through Seney National Wildlife Refuge in the Upper Peninsula of Michigan.